Dare To Play It Big, Issue #060 -- What Will You Make Of Your Blank Canvas? What Will You Make Of Your Blank Canvas? The monthly thought: What Will You Make Of Your Blank Canvas? This last month has been packed full of internal changes for me. Several experiences gave way to my questioning beliefs and thoughts by which I conduct my life, and though I felt like the rug was pulled from under my feet at times it all served me to look closely at structures which only perpetuate an ego-based way of living. I feel that the main thing that we do in life is our own internal development, and so I am grateful for the experiences that make me shed more layers of ego-based beliefs. I am also quite a practical person, so the main reward that I extract from all I learn is being able to keep living my life from a more centered perspective, so to interact with people in a way which brings more peace and compassion to us all. I have also had my husband's sister and mom visiting in London for a week. I always enjoy the time with them - they are both loving and kind women, as well as extremely strong, and I am thankful for all the good advice about life that they share with me. We visited the British Museum among other places, where I enjoyed a little stall in which you could actually touch items and know more about them with the explanations of a member of staff. 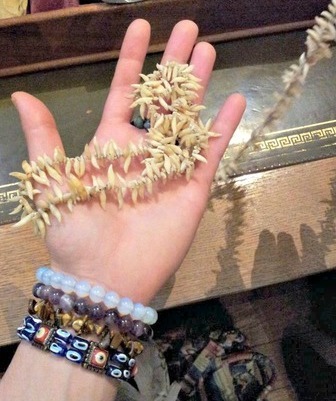 I held in my hands a necklace made of dolphin teeth, dated around the 1700s (see the picture). Apparently fishermen would use everything from the animals they captured, and the teeth of dolphins were used as coins or to make necklaces to give to the important men of the tribe. As I held the necklace in my hands, I felt this warm, soft, loving energy, and the image of dolphins came to mind. It felt all of a sudden as if the energy that the dolphins carried through their lives was still alive in the teeth that made the necklace. And then I remembered that we are able to access that soft warm energy whenever we want, because we all contain the whole universe within us. Bringing this kind of eternal love into our daily life is, I feel, what these times call for. A few weeks ago I went to buy a new diary for 2013. Setting up my diary for the coming year is a ritual for me. You see, my diary is very special to me: it contains not only lists of to-do things, but also thoughts, drawings, memories, dreams, wishes... I even paste on it things like flowers, leaves, or pieces of paper I come across. It really feels like a writing testimony of my life. I went into the stationery shop seeking a diary just like the one I've had for 2012. But browsing through many types of diaries, I found a very special and different diary. It had no lines. All it had was blank pages with the date on top. It felt like a sign: living my life with no lines - where every day is a blank page, ready for me to make of it whatever I want. So I bought it and I'm now in the process of making a new cover for it. In the same line my thoughts in the past month have been directed towards how it is that each of us creates our own life, and how much we do/say or don't do/say as a reaction to what other people are about. We tend to compare ourselves to others - am I as beautiful as that person? Am I as as active, or as organized, or as easy-going, or as interesting as that other person? Do I seem to live my life as fully as that person does? However, if you ditch the idea of comparing yourself to others then what's next is a blank canvas, like the blank pages of my 2013 diary, all open for you to create what you want. To be the person that you want to be, because it pleases you, not because you think you 'have' to be that person. We're just over a month away from starting a new year. This is the perfect moment to bring your life up a notch and start thinking how it is that you want to experience yourself within your life. Maybe it's time you look deeply inside and observe that you have chosen a job, a partner, a behaviour, a personality or a lifestyle that you don't really like but that you thought you 'had' to choose because of whatever reason. And so you can then make a decision that you are going to live your life, as much as possible, choosing to experience yourself in the way that most pleases you. You can choose to create your life, one day at a time, with only one standard in mine: yours. 1. Look at what you want. 2. Look at where you're at in relation to what you want. 3. Take small steps towards bridging the gap between what you want and where you're at. That's it. No comparison to others, no standards other than your own. No massive scary jumps - just little steps that will bring you in due time to wherever you want to be. I'll give you an example of how I apply the formula: I want to be a person who can keep a sense of humour at all times, specially during difficult circumstances. Where I'm at: I'm usually lighthearted, but I can get very trapped by emotions when life gets tough. A step that I'm taking to bridge the gap: I'm watching a series of Monty Python movies and sketches and absorbing the quality of seeing the funny side in a variety of scenarios. If you live in any of the so-called first world countries, then you're used to seeing lots of CCTV cameras about. While they can be there to protect us against crime, they can also be seen as intrusive elements, creating a police state, a la 1984 manner that George Orwell described. Here's a little video that will make you smile: a collection of beautiful moments performed by all sorts of people and recorded by CCTVs. "Be infinitely flexible and constantly amazed."